December 2, 1999: The Leonids of 1999 didn't disappoint astronomers who were looking for a show. Observations from the Middle East to Europe reported a beautiful shower of meteors, with the peak of activity centered on 02:05 UT on Thursday, November 18 as the Earth passed through the debris stream of comet Tempel-Tuttle. The high rate was substantially greater than the 500 to 1000 per hour that most experts had predicted. Many global observers were struck by the abundance of faint meteors and the relative absence of bright fireballs, however some observations indicated that the fraction of fireballs appeared to increase after the peak of the shower. By contrast, the Leonids of 1998 were marked by a significant number of these bright fireballs that astronomers call "bolides." While the level of activity may have been higher than scientists had predicted, the predicted timing and other aspects of the shower were right on the money. Astronomers Rob McNaught (Australian National University) and David Asher (Armagh Observatory) noted in a circular to the International Meteor Organization on November 9th that their models predicted the time of maximum to be 02:08 UT on November 18 in the Mediterranean region, with an uncertainty of around 5 minutes. The Leonids occur when the Earth encounters debris left from comet Tempel-Tuttle, and are the cosmic equivalent of bugs hitting the windshield of an automobile. However in the case of the meteor shower, the vehicle is the Earth on its journey around the Sun, and the bugs are tiny sand-grain-sized particles traveling at speeds of over 140,000 miles per hour. When these particles are vaporized in the Earth' s atmosphere, we observe the heat and light associated with the streaking particle as a meteor blazing across the sky. Comet Tempel-Tuttle enters the inner solar system every 33 years, each time leaving behind a fresh trail of dust and debris. When the Earth encounters such a trail of debris, we can observe a meteor shower or storm. Over time, a given debris stream from the comet will lengthen, but remains fairly narrow and dense. Thus we can see episodes of increased Leonids activity not only in the year when the comet makes its swing into the inner solar system, but also for several years around this point in time. This time around, the shower observed in 1999 was from a debris stream that the comet ejected three revolutions earlier in 1899. Thus the debris stream that produced this year's meteor shower is actually 100 years old. The Asher-McNaught model, published in a recent edition of the Monthly Notices of the Royal Astronomical Society, makes some very definitive predictions for what we'll see in the coming years. Observers in the year 2000 will be handicapped by a moon near last quarter, putting it very near the constellation of Leo, the radiant point for the shower. The brightness of the moon will diminish the number of faint meteors that can be seen. The Earth is predicted to pass near two different debris streams of significance, however, the first ejected from the comet in 1733, and the second from the year after the comet's discovery in 1865. Observers in western Africa, western Europe, and northeastern South America will be favorably located to view the first peak, predicted to occur at approximately 03:44 UT on the 18th of November. The second peak will be visible to stargazers in North America, Central America, and northwest South America some four hours later, near 07:51 UT. 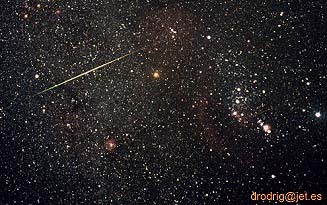 If the 2000 Leonids disappoint, then the 2001 Leonids should be the redemption for a poor sky show the year before. The moon is nearly new during this time of November, promising dark skies for observing. The presence of three different debris streams offers the possibility for a spectacular show from many different parts of the world. 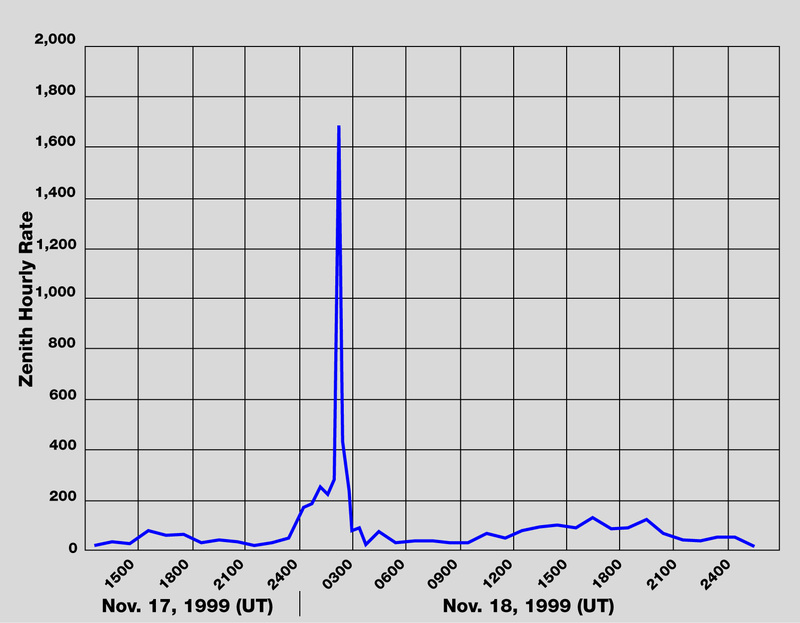 The activity begins with the Earth's close passage to the 1767 dust trail, providing a peak near 10:00 UT on November 18, 2001 that will be visible from North and Central America. Estimated activity is in the vicinity of 1,500 meteors per hour. Seven hours later, the Earth will pass through overlapping debris streams, ejected from Tempel-Tuttle in 1699 and 1866. Dual peaks at 17:31 UT and 18:19 UT will make for an excellent sky show over Australia, East Asia, and Central Asia. The moon will be nearly full during the 2002 Leonids activity, again diminishing the observing quality, as was the case two years earlier. As was the case in 2001, the Earth will be encountering two different debris tails, the first from 1767, and the second from 1866. A first peak of about 15,000 meteors per hour (ZHR) will be seen over western Europe and Africa as well as northern Canada and northeastern South America on November 19, 2002 at about 04:00 UT. The second and more intense peak of about 25,000 meteors per hour will occur over North America at 10:36 UT the same night. For your long-range planning, consider the Leonids in November of 2006. While Tempel-Tuttle will have been on its out-bound journey from the inner solar system for over 8 years, there remains the possibility of a small and well-defined outburst visible from parts of western Europe and Africa, as the Earth passes directly through the debris stream from the visit of the comet in 1932. The shower is predicted to peak at about 04:45 UT on November 19, with a Zenith Hourly Rate of about 100 meteors per hour. Observations from the 1999 Leonids will help to refine these predictions and the models of Earth encounters with Comet Tempel-Tuttle, as well as those from other meteor showers. Leonids on the Moon -- Nov 3, 1999. Leonid meteorite impacts on the Moon might be visible from Earth and provide a means for long-distance lunar prospecting. NASA Meteor Balloon Rises Again -- Nov 1, 1999. NASA scientists are planning to launch a weather balloon into the stratosphere on November 18 to capture a recording of the Leonids meteor shower from 100,000 ft.
Leonids in the Crystal Ball -- Oct 27, 1999. Is 1999 the year for a Leonids meteor storm? Experts make their predictions. Pop! Ping! Perseids! -- Aug 13, 1999. The Science@NASA meteor balloon popped before reaching the stratosphere but many meteor enthusiasts still saw and heard the Perseid shower. Perseids Live! Balloon Flight Planned -- Aug 6, 1999. A NASA weather balloon will ascend to the stratosphere for a live webcast of the 1999 Perseids. 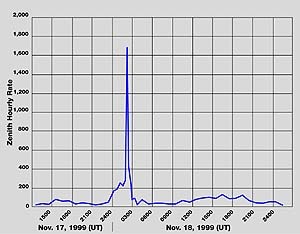 The Leonid Meteor Outburst of 1997 -- July 16, 1999.Newly released video shows a flurry of Leonids in 1997 that briefly rivaled the great meteor storm of 1966. The 1998 Leonids: A bust or a blast? -- Nov. 27, 1998. New images of Leonid fireballs and their smoky remnants.